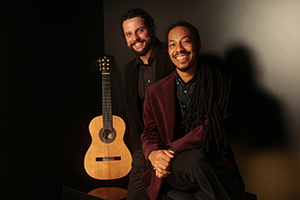 Brasil Guitar Duo, a 2006 winner of the Concert Artists Guild International Competition, and hailed by Classical Guitar magazine for its “maturity of musicianship and technical virtuosity,” is equally at home on a classical or a world-music series. Its innovative programming features a seamless blend of traditional and Brazilian works, resulting in a full global touring schedule and a growing catalogue of critically acclaimed recordings. The Duo has appeared internationally on major concert series and at festivals in Cuba, Germany, England, South Korea, Colombia, Brazil, Austria, Panama, Poland, and Bermuda. Recent and upcoming U.S. engagements include recitals at venues in New York, Santa Barbara, Miami, Houston, Dallas/Fort Worth, St. Louis, Tucson, Portland, Nashville, San Jose, and Oakland.